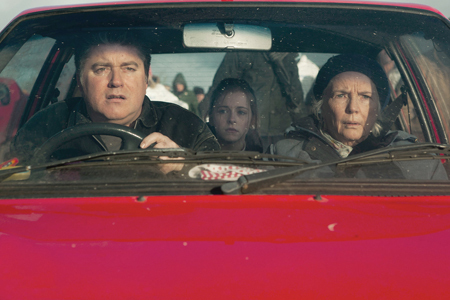 Pat Shortt, Kelly Thornton, and Fionnula Flanagan in Life's A Breeze. The Galway Film Fleadh will mark its 25th anniversary next month when the film festival screens the world premiere of Life’s a Breeze, starring Pat Shortt and Fionnula Flanagan. Life’s A Breeze, by Lance Daly, who previously directed the Irish and international hit Kisses, is a feel-good ‘recession comedy’ about a family struggling to stay afloat and stay together. Unemployed slacker Colm (Shortt ), his ageing mother Nan (Flanagan ) and his niece Emma (Kelly Thornton ) must overcome their many differences to lead their family in a race against time to find a lost fortune. The film also stars Eva Birthistle, Gerry McCann, Philip Judge, Lesley Conroy, Peter Coonan, Brian Gleeson, Paul Ronan, and features cameos from Ryan Tubridy and Joe Duffy. The screening of Life’s a Breeze will be attended by Pat Shortt and Fionnula Flanagan. The 25th Galway Film Fleadh takes place from July 9 to 13 and will feature masterclasses, public interviews, debates, workshops, and seminars, in addition to screening Irish and international feature films, shorts, animations, and documentaries.